General Business Terms and Conditions - The purchase order of AlfaFIT s.r.o., the Internet shop operator, is in full compliance with the applicable Czech legislation and with the usual business practices in the Czech Republic. These GTCs apply to all online stores operated by AlfaFIT s.r.o. in any language mutation. All offered goods come from proven importers or distributors in the Czech Republic, meet all the required legal conditions, are of standard quality and are provided with a full warranty according to the valid legal regulations. Site visitors are aware that the content of the website in any language version is informative only. Purchase on sites operated by AlfaFIT s.r.o. are governed exclusively by the law of the Czech Republic and the products are primarily provided with information in the Czech language. Sending an internet order of selected goods the customer confirms the validity of the orders and agrees with the terms of an Internet portal www.alfafit.cz. If the customer when the order is filled in correctly initials in electronic form or to register, he will be on the e-mail address receive a copy of the order as confirmation of registration of the order to the order of the e-shop. Upon registration, the customer will also be sent a login and password for any other purchases in e-shop and check order. If there is no copy of the order to the specified email address as soon as possible, please contact us. You can also order goods by phone or e-mail. If between sending an order confirmation and a change in prices, ordering has the right to withdraw from the order or accept the price change. The order is considered binding for both parties since its confirmation by the supplier. The order confirmation is ordering informed by email or phone. Goods of price action (product name has the word ACTION) will not provide additional discounts. Discounts can not be added and combined. Seller reserves the right to contact the customer by telephone to verify or clarify the order as such. Terms of higher order, some missing or inaccurate data and so on. 2.1 Each new order is binding (Civil Code § 1724 et seq., Act no. 89/2012 Coll. ), According to our terms and conditions. If the consignment, order will be sent to the customer picked up on delivery, will in any case required to pay the costs incurred in sending goods and handling fee (a penalty) of 500, - CZK. By submitting your order, you agree to our terms and conditions and contractual fine in this amount. The receipt, processing and shipping orders, the buyer is informed by email mentioned in the order or by SMS to a mobile phone number. On the rationale for non-acceptance or rejection of the consignment (eg. Not received invitation from the deliverer, unordered merchandise, vacation, trip abroad, etc.) Will not be taken into account. Identification of the customer is possible through IP and ISP providers that are part of the order. The consumer has the right within 7 days from the return shipment actively ask to resend goods ordered. The consumer also pays the cost of an order prior vain postage. Method of payment of such an order will always advance payment to a bank account. In this case, a penalty will be charged. If the buyer requests within 7 days from the return shipment to resend the ordered goods or sending refuses, it will be issued a call for payment of the cost of shipping the consignment, including contractual penalties. In the case of non-payment of the amount owed, the claim will be dealt with legally. 2.2 All information displayed on the website www.alfafit.cz are for informational purposes only and are not an offer under § 1732 Para. 2 Act no. 89/2012 Coll., Civil Code. 2.3 If entering multiple orders from the same buyer within a time period which falls on the same date of dispatch of the orders, the seller reserves the right to combine because of efficiency and economy, all these orders into one. For the same buyer orders are considered orders placed with the same manner of delivery or delivery to the same address and one common information, such as: name, telephone or email. The order can be canceled via phone or e-mail if the state orders received, there was no confirmation of the order and the goods were not shipped. In case of later cancellation, the operator of the portal www.alfafit.cz claim for damages, especially of documented costs related to the shipment of goods. Shop operator has the right to cancel the order or its part in the event that the goods ordered during the order process ceases to produce or supply the Czech market, or to substantially modify its price. The cancellation of an order the customer will be informed. If you already have the value of goods ordered in canceled orders paid, it will be refunded the relevant amount as soon as possible. Goods in online store labeled "stock" is either in the shipping warehouse or external storage. If the shipping of goods in the warehouse are dispatched the next business day from receipt of order. If the stock of external storage, then the time of delivery extends about 2-3 business days. If not in stock, we can not guarantee no deadline because it depends on other suppliers and importers. When receiving the goods the customer is obliged to check whether the consignment does not show obvious signs of damage. If the shipment is damaged, the buyer is entitled to refuse the shipment or ascertain the extent of damage in the presence of the carrier and then file a claim with the carrier, which is possible within three days after delivery. The rejected shipment will be replaced by a new as soon as possible. The place of delivery is the address stated by the purchaser in order as the delivery address. For environmental reasons, tax documents (simplified invoices or invoices) issued only on request (to order notes indicate "Request invoice") or can be emailed. Shipments are sent via carriers, or you can pick up your order personally see. further specification of the method of delivery. Handling service is charged at EUR 48, - CZK to every order. For orders with the price of goods in excess of 349, - CZK discount is offered for handling service 100%. Basically, therefore, the price of goods orders exceeding 349, - CZK handling service is free, except for the following cases. Handling service is applied also to the delivery of goods in the form of a personal collection. If the billing handling service subject to special conditions of marketing and sales actions, may also be charged with the cost of goods orders exceeding 349, - CZK - eg. For program AlfaFIT Benefit, which is always charged. If the price of the ordered goods is below 349, - CZK (return, return of ordered goods, withdraw from the contract, etc.) Are entitled to a discount expires and the buyer is obliged to pay the additional cost of the handling service in full. Entitled to a discount expires in the case of abandonment binding confirmation. For orders with the price of goods over 3000, - CZK or its equivalent in foreign currency, a discount on traffic in selected modes. Discount does not apply to transport buyers who are participants in the program AlfaFIT Benefit, or other marketing events. Discount on Traffic will be deducted from the price of transport only and does not affect the price of other items in your order. The discount can not be applied to transport the items ordered, fee or other method of payment for services rendered in connection with the clearance order. Discount transport services are provided at Czech Post - a package to hand the package to the post office, Uloženka (i Uloženka Uloženka Partner), Slovak Post. If the price of the goods ordered drops below 3000, - CZK (return, return of ordered goods, withdraw from the contract, etc.) Are entitled to a discount expires and the buyer is obliged to pay the additional cost of transport in full. Entitled to a discount expires in the case of abandonment shipments of transportation services. COD - in the consignment delivery service (Czech Post, couriers, Uloženka). 5.1 Overpayments any incurred by the customer in the amount of CZK 100 (or. Equivalent in foreign currency) reserves the operator of the online store to leave as credit for future orders. Overpayments in higher value on request shall be sent to the customer free domestic bank transfer CZK. In case of sending in another way such overpayments will be netted against the cost of transaction fees. The rights and obligations of the parties regarding the rights of defective performance shall be governed by the relevant legislation (including the provisions of §§ 1914-1925, §§ 2099-2117, and §§ 2161-2174 Law no. 89/2012 Coll., Civil Code). - The thing meets the requirements of the legislation. Unless the thing above mentioned features, the consumer may require the supply of new things without defects unless due to the nature of the defect unreasonable, but if the defect affects only part of the things consumers can request a replacement part; if this is not possible, it can withdraw from the contract. If, however, due to the disproportionate nature of the defect, especially if the defect can be removed without undue delay, the consumer is entitled to a free remedy. The right to deliver new things, or replace parts of the consumer in the case of removable defects if the matter can not be properly used for recurring defect or for a larger number of defects. In this case, the consumer has the right to cancel the contract. If the consumer withdraws from the contract or does not apply if the right to deliver new things without defects, to replace its parts or repair things may request a reasonable discount. The consumer has the right to an adequate discount even if the seller can not deliver his new thing without defects, replace the part or thing to fix, and if the seller has not remedied within a reasonable time, or that the remedy seemed significant inconvenience to the consumer. If the consumer is entitled, at defects can be removed for repair or supplement what is missing, or a reasonable discount from the price, and irremovable defects for which it is not a thing to use, the right of withdrawal, or at a reasonable discount from the price, it belongs to him reimbursement for expenses incurred in the exercise of this right. The consumer is entitled to exercise the right of defect that occurs in consumer products during the twenty-four months after the takeover. When manifest defect within six months after the takeover, it is considered that the case was defective at the time of the takeover. If at selling things on its packaging, the instruction manual attached to things or in advertising, in accordance with other laws and regulations specify the period during which the case may be applied, the provisions on the guarantee for quality (eg. Discount due to a shorter minimum period durability). All goods come from authorized importers and distributors for the Czech Republic, is the standard of quality and is backed by a full warranty under the applicable legislation. The warranty does not cover damage caused by unauthorized intervention, as a result of using the goods for other than its intended purpose, improper storage, improper handling, mechanical damage that is not caused by wear and tear resulting from normal use, natural disasters or acts of God. Guaranteed characteristics of a product is fully dependent on the specifications referred directly to the manufacturer. We recommend that before you send the goods to the complaint, contact the customer helpline on tel: 220 570 220 or 773 470 093, our trained staff will inform you about all aspects of good practice complaint. Defective goods can comply with the law and sent to headquarters. For the quickest processing of your request, we recommend shipping address to the mailing address: AlfaFIT Ltd., PO Box 629, 170 06 Praha 7. Goods sent by registered post (eg . : a package in your hand or registered packet) in order to reclaim the shipment if there was a case of loss or damage. Our online store accepts no responsibility for damages resulting from insufficient or no insurance of goods in transit from the customer. Do not send a shipment cash on delivery - shipments sent to customers by mail order will AlfaFIT Ltd. taken. Tell us about the complaint by telephone, e-mail or mail. Goods sent by registered post (eg . : a package in your hand or a registered parcel) to our address and Describe the reason for complaint. Claims, including the removal of defects must be settled without undue delay, within 30 days of the claim, unless the supplier and buyer agree on a longer period. After this period the purchaser has the same rights as if it were a removable defect. The period for settlement of claims is suspended if the seller has not received all the documents necessary for handling complaints (goods or parts thereof, other documents etc.). The seller is obliged to require additional documentation from the buyer in the shortest possible time. The deadline is suspended from that date until delivery of the required documents by the buyer. The claimant is obliged to collect the matter within one month of the expiry of the time when the repair or adjustment should be made, and if it was made later, within one month of the notification on its implementation. Failure to do so is obliged to pay a fee for storing the same as defined in §2159 of the Act 89/2012 Coll. Fee is CZK 99 for each additional day of storage stuff after a period of 30 days after the call for takeover. If you were charged for storage, the matter will be issued to the customer after the settlement of the amount owed for storage. For goods purchased through the online store has a buyer - not an entrepreneur - a natural person under the Civil Code (§§ 1829-1837) entitled within 14 days of delivery (pick) for returning the goods without giving a reason. The goods must be eligible for resale. The goods must not be damaged in any way, bearing signs of use or otherwise damaged and must be packed in original undamaged packaging along with all the accessories. The goods must be accompanied by all documents. For withdrawal from the contract within the legal deadline, contact our staff at tel: 220 570 220 or 773 470 093 who will inform you about next steps or email within 14 days of delivery (pickup) orders loosely worded "Withdrawal from purchase agreements within the statutory period, "containing all the particulars required by current legislation (in particular, ie: name, address, order number, date of receipt of the order, the information that it is withdrawing from the contract within the statutory period, the number and type of returned goods, bank account number to refund a customer's signature) on objednavky@alfafit.cz or to our mailing address AlfaFIT Ltd., PO Box 629, 170 06 Praha 7. Goods that are subject to withdraw from the contract (returned goods) must be delivered to the mailing address within 14 days after sending the notice of withdrawal from the contract, if not addressed, together with a notice of withdrawal from the contract. If this deadline is not met entitled to withdraw from the contract expires. Goods sent by registered post (eg . : a package in your hand or registered packet) in order to reclaim the shipment if it were lost or damaged. Our online store accepts no responsibility for damages resulting from insufficient or no insurance or packing of goods in transit from the customer. Do not send a shipment cash on delivery - shipments sent to customers by mail order will AlfaFIT Ltd. taken. Provided that the conditions for the customer to withdraw from the contract will be made within 14 days of financial compensation. In accordance with Act 89/2012 Coll. § 1834 is not entitled to a refund for services to him in connection with the sending of goods supplied (eg. Odbavné, dobírečné etc.) Because these services were fully implemented prior to the withdrawal from the contract based on the express wishes of the customer, which has been expressed sending the order. According to § 1832 paragraph. 2 is not entitled to a refund rates for delivery in full, if you did not choose the cheapest delivery method. In this case, the customer will pay the seller the price of the cheapest means of delivery, the seller provides. If the return of the goods will expire customer is entitled to a discount on traffic according to section 4.2. will be an amount corresponding to the discount on transport humiliated amount for returned goods. If a product is annotated, it has a shorter minimum expiration date ("exp . : DD / MM / YYYY, exp. : DD / MM / YY, exp . : MM / YYYY or exp . : MM / YY - eg . : exp . : 07/21/2014 or exp . : 07/14), the buyer is aware of the fact that this is in accordance with the wording of the law on so-called. perishable goods and tear and therefore in accordance with § 1837 of the Civil Code not require withdrawal from the purchase agreements within the statutory period. This provision does not affect the claim for goods due to damage during transport. The consumer can withdraw from the contract for the supply of sealed goods which the consumer has removed from its packaging and hygiene reasons, it can not be returned. The goods also can not be in the 14- day period without giving a reason to return, if the purchaser either a legal entity or a natural person. The delivered goods not covered by the statutory requirements for withdrawal from the contract, the customer will be returned after paying the postage from the customer by bank transfer to the bank account of the company AlfaFIT sro. If the customer fails to do so, he is obliged to pay a fee for storing similarly defined in §2159 of the Act 89/2012 Coll. The fee is 99 CZK per day of storage things. The fee is charged for each day after the expiry of 30 days after the call kk payment service until payment or other debt settlement client, which prevents sending things. If you were charged for storage, the matter will be sent to customers after the settlement of the amount owed for storage. AlfaFIT Ltd. values ​​the trust of its customers and is committed to protect the data that had to be given to implement the order. These data and data will in no case be given to a third party. The operator will use the data and information only for everyday communication with customers. 8.1 The buyer grants explicit consent to the transfer of electronic addresses and information about ordering goods to a third party, which the company Naspers OCS Czech Republic, sro, ID: 02387727se based Karolinská 650/1, Prague 8, Postal Code: 186 00, including operators of servers heureka .com and heureka.sk for the purpose of questioning within the "Verified by customers" and "Verified Customer". AlfaFIT Ltd. notes that the information on the website is partly taken from third parties and may contain material and technical inaccuracies or typographical errors and may be updated without notice. The company can not absolutely guarantee the accuracy of their contents. AlfaFIT Ltd. is not liable to any other party for damages caused by using information from an online store or linked websites, not if the information on the customer subsequently confirmed in writing by e-shop. After a previous order, it is possible to pick up the goods at our Prague point of contact, which is located on the premises Vínečko Wine Trade Fair 18, Prague 7. The price of delivery through the personal collection of the contact point is CZK 0 (zero CZK). For orders with the price of goods to CZK 349 is charged to cost of goods Odbavné service - see para. 4.1 GTC. Orders can be picked up in the operating time of the contact points: Mon - Fri: 11:00 - 22:00 Sat - Sun 3:00 p.m. to 8:00 p.m.. If you give an order to the client's mobile phone number will be informed by SMS that the goods are ready for collection. If the order mentioned electronic address, the client will be informed of the possibility to pick up the goods via email. If the goods are in stock, then for orders made on weekdays until 15:00. Goods usually ready the same day after 17.hodině. If the order is sent later is usually ready for pickup the next business day after 17.hodině. To check the availability of your order you can use your phone to a point of contact: 222 965 275. The branches Uloženky (Heureka Point) is stored only pre-ordered goods. Mostly second-third working day after ordering. Remember in order to enter a phone number and email address so you Uloženka to inform you that your order is ready for pickup. So please wait for a visit to the challenge Uloženky. Orders can be picked up within 7 days of its filing. Payment on receipt of cash in CZK - cash on delivery (in Slovak branch in Bratislava in EUR) or prepayment to the bank account. For orders with a value of goods over 3.000, - CZK Discounts apply to traffic under point 4.2 GTC. After application of the discount service in the Czech Republic for orders over 3.000, - CZK FREE. Price Service for orders up to 3000, - CZK 59, - CZK. Prepayment to account for FREE. Payment on delivery 20 CZK. After application of the discount service in SK branch in Bratislava on orders over EUR 120, - FREE. Price Service for orders up to 120, - EUR 2.27 EUR. Prepayment on account denominated in euro FREE. Payment on delivery € 0.77. A complete overview of branches Uloženky -Heureka Points including addresses, operating times and contacts are listed in Section Delivery. For orders with the price of goods to 349 CZK / € 13.41 is charged to cost of goods Odbavné service - see para. 4.1 GTC. The branches Uloženka Partner (DPD Parcel Shop) is stored only pre-ordered goods. Mostly second-third working day after ordering. Remember in order to enter a phone number and email address so you Uloženka to inform you that your order is ready for pickup. So please wait for a visit to the challenge Uloženky. Orders can be picked up within 7 days of its filing. Shipment weight max. 20 kg. For heavier shipments, the price determined individually. Payment on receipt of cash in CZK - cash on delivery or prepayment on the bank account. For orders with a value of goods over 3.000, - CZK Discounts apply to traffic under point 4.2 GTC. 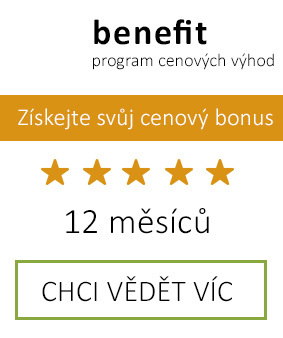 After application of the discount service for orders over 3.000, - CZK FREE. Price Service for orders up to 3000, - CZK 59, - CZK. Prepayment to account for FREE. Payment on delivery 20 CZK. A complete overview of outlets Uloženka Partner, including addresses, operating times and contacts are listed in Section Delivery. For orders with the price of goods to CZK 349 is charged to cost of goods Odbavné service - see para. 4.1 GTC. The branches Uloženka Partner (DPD Parcel Shop) is stored only pre-ordered goods. Mostly second-third working day after ordering. Remember in order to enter a phone number and email address so you Uloženka to inform you that your order is ready for pickup. So please wait for a visit to the challenge Uloženky. Orders can be picked up within 7 days of its filing. Shipment weight max. 10 kg. For heavier shipments, the price determined individually. Payment on receipt of cash in euros - cash on delivery or prepayment on the bank account. For orders with a value of goods over 3.000, - CZK Discounts apply to traffic under point 4.2 GTC. After application of the discount service for orders over 240 EUR free. Service price for orders from 120 EUR to 239.99 euros 2.07 euros. Price Service for orders up to 120 EUR € 4.00. Prepayment to account for FREE. Payment on delivery € 0.77. A complete overview of outlets Uloženka Partner, including addresses, operating times and contacts are listed in Section Delivery. For orders with the price of goods to € 13.41 is charged to cost of goods Odbavné service - see para. 4.1 GTC. For orders with a value of goods over 3.000, - CZK Discounts apply to traffic under point 4.2 GTC. Discount transport services are provided at Czech Post - a package to hand the package to the post office, Uloženka (i Uloženka Uloženka Partner). The price of transport after applying discounts at selected modes of transport CZK 0 (zero CZK). As part of marketing and sales actions they can transport prices vary and are subject to special trade conditions for the promotion or discount. In the "AlfaFIT Benefit" is the right refundable always even order a catalog price of CZK 3,000. The consignment will be the Czech Post (package in hand, packages in the mail) delivered to your designated location (option to send consignment of employment - be sure to include the name of the company) the following working day after dispatch. Orders paid cash on delivery if ordered goods are in stock, we ship by the next working day after receipt of order. Orders paid by bank transfer are delivered the next working day after crediting their accounts. Delivery (package in hand, packages to the post office) guarantees the Post the next working day after the date of filing. The price of the service is 59, - CZK. Payment on receipt of the shipment in cash - cash on delivery (36, - CZK) or by prepayment by bank transfer to the account (for free). The length of time the package deposit: maximum 7 days. When sending a service package in the mail, mail is not delivered a classic paper notice of receipt. Therefore, pay attention to the course of the period of deposit and consignment to inform on their mail. For orders with the price of goods to CZK 349 is charged to cost of goods Odbavné service - see para. 4.1 GTC. The consignment will be delivered by courier to ALS your designated location (option to send consignment of employment - be sure to include the name of the company) the day following the expedition between 8:00 to 6:00 p.m. pm. Orders paid cash on delivery if ordered goods are in stock, We ship by the next working day after receipt of order. Orders paid by bank transfer are delivered the next working day after crediting their accounts. For shipments "to the home address" before they are delivered to you by courier least 2x contacted by telephone for arranging the most suitable delivery date. Another possible shipping "on the home address - evening service." This service is only possible in these locations list >>>. Conditions consistent with "the ALS home address" except time interval for mail delivery. Evening service delivery enables delivery by 17:00-21:00 pm. This service should be selected at the time of order entry. Please note that the place of delivery specified in the list of sites where the service is provided. Request for evening service is to be filled in the order notes. Service price 136, - CZK. Payment on receipt of the shipment in cash - cash on delivery (36, - CZK) or by prepayment by bank transfer to the account (for free). The length of the deposit period of the package: according to the agreement with the courier - a maximum of 3 attempts at delivery or a week. For orders with the price of goods to CZK 349 is charged to cost of goods Odbavné service - see para. 4.1 GTC. The consignment will be delivered by courier partner PPL throughout the territory of the Slovak Republic. Transport cost varies depending on the weight and ranging from 11.15 EUR to 18 EUR for weight 1 kg - 10 kg. The price varies according COD COD amount. Payment of prepayment to the bank account in EUR is free. Slovakia shipment will be delivered to your designated location within 48 to 72 hours after the date of shipment. Orders paid cash on delivery if ordered goods are in stock, we ship by the next working day after receipt of order. Orders paid by bank transfer to our account Slovak are shipped the next working day after crediting their accounts. Before delivery by courier will at least 2x contacted by telephone for arranging the most suitable delivery date. If the shipment is sent on delivery, the payment is due upon receipt of the consignment courier directly in euros. For orders with the price of goods to € 13.41 is charged to cost of goods Odbavné service - see para. 4.1 GTC. Applies to all shipments to Slovakia with a price lower than 500, - EUR and weighing up to 5 kg. For orders with a value of goods above 120 EUR discounts on transport in accordance with paragraph 4.2 GTC. After application of the discount service for orders above 120 EUR 3.96 EUR. Price Service for orders up to 120 EUR € 5.99. Prepayment on account denominated in euro FREE. Payment on delivery € 2.34. Orders paid cash on delivery if ordered goods are in stock, we ship by the next working day after receipt of order. Orders paid by bank transfer are delivered the next working day after crediting their accounts. Shipment is due to cost savings 7-10 working days after dispatch. For orders with the price of goods to € 13.41 is charged to cost of goods Odbavné service - see para. 4.1 GTC. Normally we send goods to all EU member states and countries outside the EU. The transport cost is calculated depending on the weight and destination. Based on the agreement the shipment is sent either by courier or Czech post. An order may only be paid by prepayment - payment to the bank account AlfaFIT Ltd. - See Article 12. Prepayment. Select sending abroad outside the Slovak Republic - will be displayed in the order price 0; price will be specified on the basis of further communication, so the price for the goods you do not convert until the final price will be confirmed. Orders transported by the carrier (Czech Post, Slovak Post, PPL, Uloženka) can be paid by bank transfer AlfaFIT Company Ltd. Personal collection orders with the contact point in Prague 7 due to security pay only in cash. Orders can pay by credit card or by carriers or on the Internet. For the pre-payment in euro use our Slovak account. Used for the prepayment of Slovakia and other euro area countries. When paying orders from other states than SR and ED wait, please confirm the amount to be paid. Payment for the transfer of all states outside the euro area can use our account in CZK Fio banka as Remember to set the bank fee payment available on the OUR. Payments disposition BEN or SHA will not be accepted. 14. Written information and guidance according to § 1820 of the Act 89/2012 Coll. - Ad a) we do not charge any costs when using the means of distance communication. - Ad g) The costs of returning goods shall be borne by the consumer (customer) and will not be reimbursed by the seller to the customer. - D j) Complaints sent via email to info@alfafit.cz or mailing address: AlfaFIT Ltd., PO Box 629, 170 06 Prague 7. The consumer has every right to file complaints to all the relevant government authorities. Delivery Costs are given in terms of delivery and the possibility of their selection is in the "basket"
Expense reimbursement are provided in terms of delivery and the possibility of their selection is in the "basket"
- The purchase agreement is concluded by the confirmation of your order. Since the draft purchase agreement (sent orders) you have the right to withdraw at the latest order confirmation or further in accordance with the applicable legislation. - The AlfaFIT s.r.o. website, whether operated in any language, is intended solely for the sale of goods under the law of the Czech Republic. Language versions serve members of national minorities or foreigners established in the Czech Republic for whom communication in the Czech language is difficult. The Purchaser acknowledges that the sale and all related matters are governed by the law of the Czech Republic. Product information in other language versions is informative only; products are primarily provided with information in the Czech language.